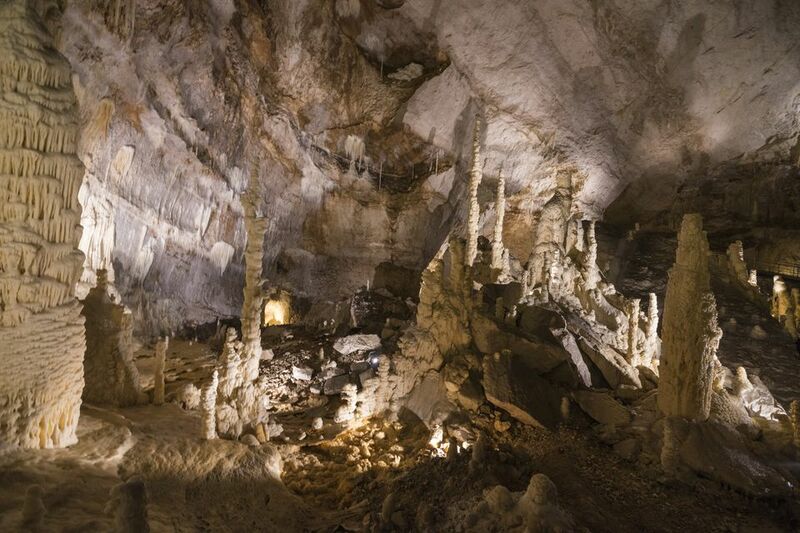 Frasassi Caves, Le Grotte di Frasassi, are Italy's top caverns and well worth a visit. The immense cave system was only discovered in 1971 and part of the caverns was opened to visitors in 1974. The caverns can be visited only on guided tours. The huge rooms of the caverns are filled with stunning stalactites and stalagmites. Highlights of the tour include the Ancona Abyss, a room so large that Milan's Duomo (the world's largest Gothic cathedral) could easily fit inside it, a crystallized lake, a Grand Canyon, and a room filled with formations that resemble candles. The guided tour on the tourist trail lasts about one hour and 15 minutes and listening devices are provided in other languages for those who don't understand Italian. The tourist trail is mainly on a walkway with some stairs and is well lit. Visitors should wear comfortable shoes and a sweatshirt or jacket as the temperature is 14 degrees centigrade (about 57 Fahrenheit) all year. Frasassi Caves can be visited by guided tour only and tickets must be purchased at the ticket office in the main parking lot at least 30 minutes before the tour. Tickets cannot be bought at the cave entrance. Arrival and Parking: When arriving by car, follow signs to the large parking lot and ticket office. Around the parking area are souvenir stands and snack bars. To arrive by train, get off at Genga station and from there it's a short walk to the ticket office and shuttle bus area. From the parking lot and ticket office, a shuttle takes visitors to the cave entrance (and returns after the tour). Tour Times: Check the website for most updated tour times and availability. Tickets: Reduced prices are available for children, adults over age 65, and organized groups. Tickets include shuttle bus and San Vittore Museum. Tickets are sold at the ticket office in the large parking lot. Website: Grotte di Frasassi has updated information about hours and prices. On a cliff above the caves is the Temple of Valadier, built in 1828, reached by a path going up the hill. A moving living nativity pageant is held there on December 26 and 30 with more than 300 actors. Genga is a tiny picturesque medieval town and castle perched on a hill overlooking the valley and Frasassi Natural Park. From the parking lot, enter the village through the archway in the defensive walls and wander through town. The medieval houses are built right into the limestone and the 11th-century church has several important artworks. Once the residence of the counts of Genga, the castle now houses the town hall, district administrative offices, and a small museum. In addition to the caves, the Gola della Rossa and Frasassi Regional Nature Park have many interesting natural features to explore on hiking paths. The larger town of Sassoferrato is about 14 kilometers from the caves. On the edge of Sassoferrato are Roman ruins and in the historic part of town, there are several museums and churches to visit. A little farther away you can take a guided tour of the Benedictine Monastery at Fonte Avellana.